Here are a few of our rebuilt magnetos that we have in stock. On the top shelves are done mags and the shelves underneath are magneto cores that can be rebuilt or used for parts. They are packed in there 3 and 4 deep! We actually ran out of space here and have many more cores in the bay area of our shop. All our exchange magnetos have been completely rebuilt, tested, and are guaranteed HOT! Remember, "We Test, Not Guess". We have too much of a turn over to accurately list our rebuilt units that we do have in stock so please contact us with your needs and let us know if you have an exchange unit or not. We literally have hundreds of mags in stock for parts or that can be rebuilt and as you can see we have many many mags all done and ready to go. The only problem I see is that we don't have every one ever built, but don't worry, we're working on that. 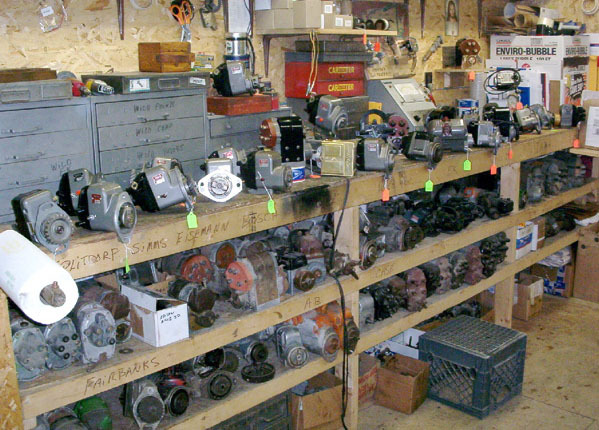 If you have cores or parts for sale at a reasonable price give us a call. To see a mag going through the rebuilding process Click Here. To see pricing for Rebuilt Bosch Magnetos Click Here. To see pricing for Rebuilt Case Magnetos Click Here. To see pricing for Rebuilt Dixie-Splitdorf Magnetos Click Here. To see pricing for Rebuilt Eisemann Magnetos Click Here. To see pricing for Rebuilt Fairbanks Morse Magnetos Click Here. To see pricing for Rebuilt International Harvester Magnetos Click Here. To see pricing for Rebuilt Wico Magnetos Click Here. To see pricing on New Wico Magnetos Click Here. To see pricing for Rebuilt Sumter, Webster or Associated Mags Click Here. We ship UPS and Priority Mail. All our magnetos are guaranteed for 1 year. Consumer is responsible for shipping costs only. Prices subject to change without notice. Not responsible for typos. Cores will be discounted if you do not exchange a complete and serviceable unit. Thank You.